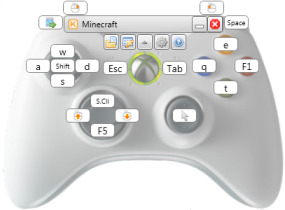 You can use these Keysticks controls to play Minecraft on your PC using an Xbox 360 controller instead of the keyboard and mouse. We're not affliated with the folks that created Minecraft or anything, we just think it's a great game so we created these custom controls for it. To try them yourself, just download the latest version of Keysticks and load the Minecraft profile that comes with it. You can use the on-screen virtual keyboard to chat using your controller in-game. Tap the left shoulder button to show / hide it at any time. 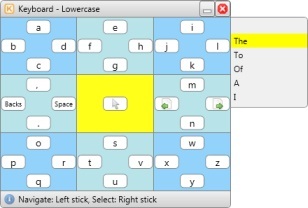 You control the keyboard using the left and right thumbsticks, and you can use the ABXY buttons to select and enter word suggestions. You can customise the controls or create your own using the drag-and-drop Profile Designer. See How to play PC games with an Xbox controller for a screenshot.